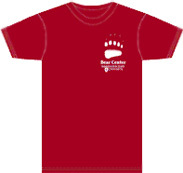 T-shirts available in crimson, black, forest green, and light grey. 1/4-zip fleece pullovers and full-zip fleece vests available in red and dark grey. Images on the back of T-shirts change periodically. Fleece items have the same image on the front of the adult T-shirts (at right) embroidered on the front left chest, and no image on the back. 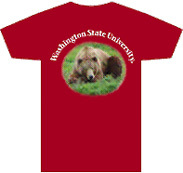 If interested, please call (509) 335-1119, email ctrobbins@wsu.edu, or send check and order information to Dr. Charles T. Robbins, Bear Center, Washington State University, Pullman, WA 99164-6410.